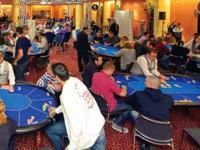 Marbella Classic Poker League, Casino Restaurant and other events at the Casino Marbella. Poker News and other events at the Casino Marbella. Inclluding the new Spring Manu. New Satellite: thursday May 5th, 8:30 p.m., 70+10, 5.000 points, Freeze Out. On May 12th, satellite with 50 buyin and 50 rebuys unlimited until level 4th. Every Friday: Friday Poker Fever Buy-in 50 /6.000 points. Simple Re-buy 50 / 6.000 points. Double re-buy 100 / 15.000 points. Every Tuesday, Azartia League: Buy-in 50 / 3.000 points. Simple Re-buy 50 / 3.000 points. Double re-buy 100 / 8.000 points. Every Sunday, Mini Bounty: Buy-in 125 / 6.000 points and 25 Bounty each player you eliminate). Just 1 re-buy 100 / 8.000 points. All these weekly tournaments start at 8:30 The player who comes early, will take 1.000 points (Early Bird). Our restaurant presents its new Spring Menu. You can try our snacks: Freshly sliced Norwegian salmon with garnish or Griddled pink prawns; some of our starters, such as Octopus with hints of barley and rigatoni on a bed of Romescu peppers, Spring salad of Jabugo ham and figs with tomato seeds and parmesan or Sautéed vegetables with mushrooms, mint jelly and pancetta strips. 4th May, next Art Exhibition grand Opening Cocktail. Elena Nevado and David Marshall will exhibit their paintings and sculptures from 5th May to 7th June, everyday from 8 p.m.
Elena Nevado, born in Stockholm, Sweden, is based in Casares, Spain, where she keeps her painting studio and breeds Andalusian horses. Her artresembles the longing for the Native Americans, the American bald Eagles, the American Paints and Appaloosa horses but also her love for the Spanish Andalusian horses. David Marshall has always lived closed to nature, first in Scotland and then on a farm in Spain. His creative impuses have come from observing the chaos and spatial organization of natural forms; he combines this fascination with a recognition that no technical application can ever compare with the original model. Motorbike and car insurance with travel assistance on the Costa, in Spain and rest of Europe.